Many players in the NBA are amongst the most well-dressed individuals in the celebrity world. After all, the NBA comes along with plenty of glitz, glamor and high salaries. As a result, many NBA players put a great deal of time and effort (not to mention money) into each ensemble they wear. Those who have never seen certain players off the court are often surprised to see how they dress, as many players have a penchant for designer clothing of the utmost quality. The following are five of the best dressed players in the NBA, all of whom can be viewed as veritable trend-setters. Kobe is on just about every “best dressed” list, and for good reason. Known for rocking the full suit, Kobe Bryant knows how to draw attention to himself without looking even remotely out of place. As one might expect, Kobe puts just as much effort looking good off-court as he does in the middle of a heated competition, and is one of the NBA’s most stylish players. It doesn’t hurt also that Kobe is one of the most well-known names in basketball, which means those who don’t even follow the sport likely have a sense for how the man dresses. His signature look: charcoal suit with strong pin striping pattern, white shirt, and bold necktie. 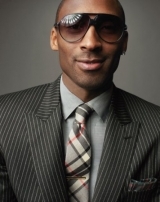 Kobe also likes to accessorize his suit & tie with complementing pocket square and tie bar. Carmelo Anthony’s name is synonymous with style. Always one that dresses to impress, Anthony embodies New York style both on and off the court. A trendsetter like no other, “Melo” turns heads wherever he goes, and is a great example of how athletes can be fashionable during their time away from the game. 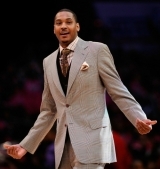 While Kobe prefers the elegant suit & tie look, “Melo” dresses both casually as well as elegant/trendy. His favorite sui & tie look: Gingham check shirts, boldly colored, striped or paisley patterned tie, and contrasting jacket with bold patterns in gray, beige, or brown. His favorite accessories include sunglasses by Gucci or LV, pocket squares, and fedora hat. 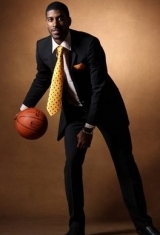 He himself said in a recent interview with GQ that he is the best dressed man in the NBA. 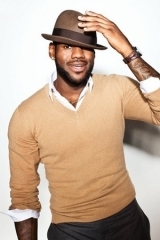 It should come as no surprise that LeBron James makes the list of best dressed players in the NBA, especially to those who have paid attention to his style during the course of his career. James’ style can only be described as “casual-hip,” comprised of elements that only the highest paid player in the game could ever be able to afford. Just as comfortable in jeans as in a full suit, LeBron James knows what he’s doing when it comes to throwing together an attention-grabbing outfit. That he has also been featured on the cover of GQ magazine is no surprise to us. His signature look consists of cashmere V-neck sweater and dress shirt that are leisurely worn with with rolled up sleeves displaying an exclusive, over-sized designer wrist watch. Dwayne Wade needs no introduction, as he is one of the most well-dressed players in the game. “Flash” has been a part of a few successful modeling projects, and is well adept at displaying his unique fashion sense. Women the world over love Wade’s ability to go from “casually thrown together” to “thoughtfully composed” at the drop of a hat, making him one of the most versatile players in the NBA when it comes to off-court fashion. He has been spotted wearing self tied bow ties, cardigan sweaters, boldly patterned neckties paired with sleek V-neck knits, elegant 3-piece suits, as well as flashy all-white tux with matching white fedora. His signature look? There is none! Mr Wade knows how to dress and can pull of almost any style imaginable. He definitely earns a gold medal for the TOP 5 best dressed NBA player award. O.J. Mayo might just have the most unique sense of style in the NBA. When off the court, mayo looks more in line with a flashy professor than a basketball player, rocking some extremely formal attire that is often comprised of three-piece suits, fat Rolex watches and sophisticated frames. As a result, Mayo commands a great deal of respect not only for the fact that he’s the number one draft pick since LeBron, but also as a result of the way he dresses. Hm, I would have loved to have seen Shawn Marion on this list, but O.J. Mayo is a decent consolation! Great list. I always liked how DWade dresses. 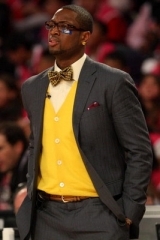 By far the most stylish guy in the NBA.